This recipe is from our yoga teacher, James. He is a very friendly chap and he first tasted this when he was out food shopping one day and ended up sharing a delicatessen owner’s lunch! Anyway Steve and I both enjoy this dish especially because of the comforting texture of the cannellini beans combined with fresh bread. Heat the beans and the water from the can in a small pan. Once hot, drain and place in a large bowl along with the tomatoes, coriander, olive oil and a little salt and pepper. Gently mix the ingredients and then taste to check the seasoning. Slice the fresh bread and lightly toast. 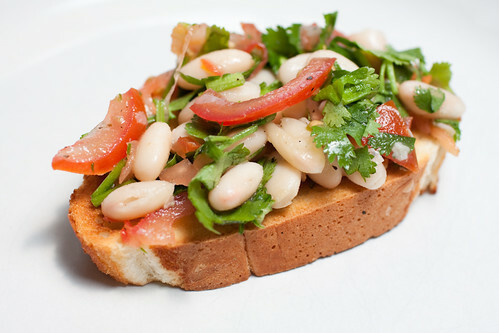 Place the bread on the serving dishes and then spoon the cannellini and tomato mixture on top of the slices. Serve immediately. In it’s original form, this recipe included a quarter of a cucumber, chopped and added at the same time as the tomatoes. Due to Steve’s inexplicable aversion to cucumbers (“They are Satan’s food.”) I have not included it here, however I am sure it will be delicious.